Masses of almonds are being harvested for ‘milk’. We all know that the ‘milk’ contains next to know physical almond. And yet, where do all the almonds go. Ever wonder what happens to the masses and masses of almonds used to make the almond milk? So I challenge you. I challenge you to make your own because a. it’s actually incredibly easy. b. it’s cheaper. c. you are then in control of your almond residue. And guess what, residue = ground almonds. Ground almonds = expensive. Buying whole almonds = 2 for the price of 1. So almond milk almond residue is gold. [Good maths is it not?]. I then challenge you to approach your local juice store/almond milk maker with this question: where do all the almonds go? Ok step 1: make the milk. Then add to breakfast smoothies, hot chocolate, or drink as is. Inspired by Madeleine Shaw. Makes 320ml approx. + 40g residual ‘ground’ almonds/almond meal. Place almonds in a glass bowl, fill with water until covered by 1-2in. And leave to soak minimum 4 hours – up to over night. Drain soaked almonds, and place in a blender with all of the other ingredients. Blend/emulsify for 2 minutes. Leave to rest 1 minute. Blend for another 2 minutes. If you have a cheesecloth, place cloth in sieve, and pour ‘milk’ through into a container. If no cheesecloth, strain first with a thin mesh strainer, place the almond residue in another bowl, then using either a thin kitchen towel or a couple recycle-able bounty/paper towel sheets, pass the ‘milk’ through a second time, squeezing as much liquid out as possible. Store your Almond Milk in a glass bottle in the fridge for up to 10 days. DO NOT TOSS YOUR ALMOND RESIDUE/MEAL. We’re getting to that later. With melted dark chocolate of choice - my personal go to is TCHO - whisked and heated until thickened. As a cookie dunking liquid. With your favourite hot beverage or smoothie. In your next bowl of oatmeal, or replace regular milk in my Bircher Muesli recipe. That moment you realize you have everything in your power to recreate your favourite breakfast… that’s what this is. Not because the ingredients are foreign, or the method complicated. Quite the contrary actually – it’s blaringly simple. And yet, for some reason, it never even crossed my mind, that I’d be able to recreate my favourite little muesli buffet at Pennethorne’s Cafe, Somerset House. So here it is. Hoping to help you realize you can bring your favourite buffet breakfast or bunch to life at home, with the power of your own two hands. nibs etc. original recipe. Serves 2. Slice dates in half down the middle, remove pit, and place 6 halves into a small sauce pan with 1/4 cup of water. Heat on medium, bring to a boil and reduce quickly to a simmer. When water has evaporated, add the remaining 1/4 cup, turning heat down to low-medium. In the meantime, place all your dry ingredients in a bowl, and mix thoroughly - I prefer with hands, rubbing ingredients gently together as I tossed and turned. Return to the date jam: as the last of the water is evaporating, dates should be soft and starting to fall apart. Smush with the end of your wooden spoon until brown paste-like consistency is formed, allowing for a couple of bite sized pieces. To serve, pour about 3-4 tbsp muesli mix into your bowl, top with date jam, and pour over your homemade almond milk. And there you have it. 5-star, restaurant worth breakfast at home (and in bed, if you so desire - who needs room service). With seasonal fruit - in this case, blood oranges. Replace oats with rolled buckwheat/spelt etc. Or include, in addition to. Substitute dried fruits with your favourite: apricots, blueberries, mango, prunes, apple. Go wild. To make the Ground Almonds from Almond Milk Almond Meal leftovers: place oven on 110*C Fan / 115-120*C, spread almond meal on a baking sheet, and place in the oven for 30 minutes – until dry. Place in a blender and process until finely ground (comparable to store bought ground almonds in consistency). Should make about 40g. Place almonds, salt in a bowl. Crack egg and mash banana into a well in the centre of the dry ingredients, whisking to incorporate the almonds. Add coconut milk and olive oil, stirring to fully incorporate. In a separate small bowl, add vinegar and baking soda – it will fizz! Then pour into batter, stir briefly to ensure evenly distributed throughout batter. Heat a non-stick pan on medium. When hot – test by sprinkling water across pan, it should fizzle and evaporate immediately – add about 3 tbsp of batter. Patience is key here – about 3-4 minutes on first side (on medium to medium low heat). It is ready to flip when you can easily slide a spatula across the entire underside of the pancake, and the top is set. Gently flip, and cook for a further 1 minute or so. 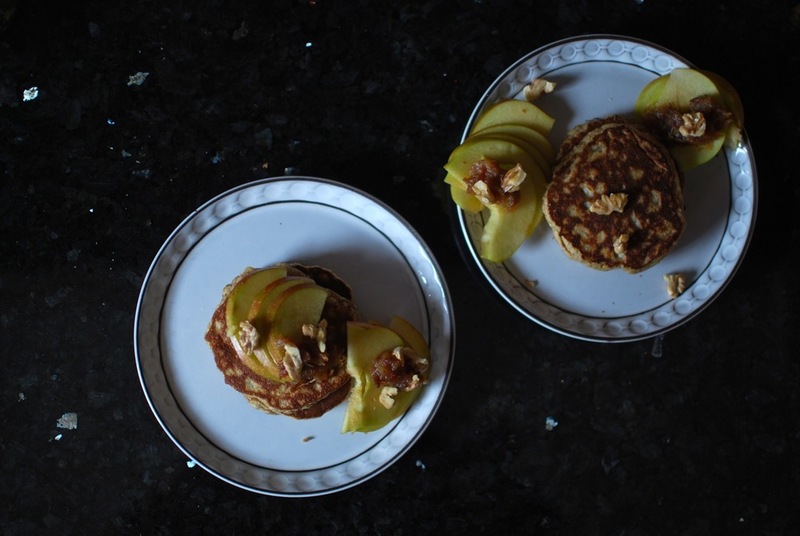 With leftover date jam, half an apple – thinly sliced, 1-2 roughly chopped walnuts – lightly toasted. Covered in maple syrup, runny dark chocolate, or yoghurt + honey. Any other leftover toppings you have lying around: dried nuts and fruits, caramel, praline, nut butter, jam.